Three months into the new academic year, and half term is already here. On some days it has felt like the longest half term and on others it flew by, but I now have a few days to catch up with myself and reflect, and that, as always, has got me thinking. “We are currently at 40,000 feet flying above Poland on our way to London. Almost 12 hours ago we took off from KL for the last time and said goodbye to our home of the last 3 years and my position as Deputy Head of Primary at GIS. Dougie and Toby are both fast asleep, and in this packed 777 I am sitting, quite alone, watching the most amazing sunrise happen as we start the next chapter of our life’s adventure and I am full of such mixed emotions. I wonder how it will feel to see friends and family at home. I wonder what it will feel like leaving them and London but not returning to KL. I wonder what living in one of the world’s most densely populated cities will be like. I wonder who our new friends will be. I wonder how long it will take Toby to settle into his new school and feel he belongs. It’s turbocharged with constant change still, 15 years since re-training to be a teacher… or rather, 15 years since the words “change” and “learning” become interchangeable in my life. I changed my career in my mid thirties to go back to University, to learn to be a teacher. That was a massive learning curve for me, and a huge change, but one I have never, for one second, regretted! When I arrived on the Roehampton campus for the first day of the first term, I remember feeling as though I had landed on the Moon. I hadn’t written an essay or gone to a lecture in over over 14 years. My fellow students were half my age and spoke a modern-day language that I just didn’t understand. The fact that I was drinking lemon and ginger tea in the refectory rather than hot chocolate with extra cream was not the only thing that marked me out as the odd one; the mature, taking-it-rather too-seriously student. Sue Young, my music lecturer, told me that day that I would be on my knees by Christmas, wondering why on earth I believed this was going to be a good idea, and boy was she right. She urged me to continue and I am forever grateful for her advice, and I made it. I discovered learning again and I thrived on the challenge, the late nights to meet hand-in deadlines and the camaraderie I felt in the mix of amazing fellow trainee teachers around me. This major life change was about learning and I loved it. I began to think that perhaps change, is actually all about learning. And if that is the case, then although learning is sometimes hard, requires huge effort and is never quite finished, learning is something I know I can do. And like learning, change can actually be a whole heap of fun and lead to outcomes that you never expected or dreamed of if you are willing to make the effort with it. Like my somewhat rapid promotion to Headship. I have always put this down to the fact that I can’t keep my mouth shut as I believe strongly that in order to influence change, you have to be prepared to be part of it, so I always volunteered. I wanted to learn more, widen my scope of impact and therefore I think I was never afraid of change. At the start of term, I had to think about how I introduced myself to the school community. What would they want to hear? What would they find interesting? What did they expect? I had read over the summer break, that students take just 2 days with their new teachers before they make decisions about what the whole academic year will be like. What routines will be upheld and what they can let slip. Well my ‘class’ were all going to be listening to me in that first week and making their mind up so no pressure there then! I am a person, unique yes, as we all are, and I happen to believe that our uniqueness needs to be encouraged and developed in order for us to come together and in a vibrant, interesting and special community. But what makes a community strong, is our similarities and our shared ‘Whys.’ Why we do what we do? Why do we do it in the way that we do? That is what makes us a special and strong community, so sharing my beliefs about what we do and why we do it, I thought would be a much more relevant approach. Well firstly, I believe that schools need to be focussed on one thing – learning. As a school leader, everything I do has to come back to one question – how does it impact on learning? All those potentially difficult conversations are made so much easier when I come back to that. If our ideas do not improve learning opportunities and outcomes for our kids, then they are not the right ideas. If our actions do not fully support learning, then we need to change them. If the activities we arrange, fun as they may be, do not positively improve learning, then again, we need to stop doing them in order to focus on doing more of the things that do positively impact on learning. Well, this brings me to belief number two: Our students get one shot in our care. We might sit in INSET meetings and discuss and share ideas and ways to improve, take time to try new things and get better, but we must always remember that our kids are with us for one very short year. They arrive in our classes in August (or September) and we have all these great ideas about exciting learning opportunities to offer them, but before we know it, we are writing year end reports, talking about next steps and wishing them well in their next form or year group. We just can’t afford to get to the end of the year and only then reflect on all the things we didn’t quite get around to doing in order to better support our kids this time around. Now. Today. We may be better for our next class, but we are not their tomorrow, so we have to remember that everything we do today has to count. It has to make a difference. More pressure I know, but our kids deserve our very best. Every day! There is an urgency in us getting it right. Our kids get one shot. One. We have to make it count. And we need to make it count for all children, no matter what their background, their culture, their language or their position. I have taught refugee children, who arrived at school with little or no English, no fixed home and no money. I have taught fee paying children who arrive at school with their own security. I have taught children with sometimes severe learning difficulties and children too exhausted by their lives to have any energy left over for learning. Children who absorb ideas and information like their life depended on it, and those who just waited it out until they were able to finally escape what they saw as the confines of school. The children I have shared my classrooms with, couldn’t appear to be more different, but the reality is that they are all the same in so many ways. And I know that you know that. Think of the perfect classroom, what do you see? What do you hear? I am guessing that the children own their classroom environment which is safe and encourages them to try new things, challenge themselves, ask questions and make mistakes. I imagine that the children are not afraid of choosing for themselves, of persisting and persevering in order to solve the most complex problems and to test themselves without judgement. They intrinsically want to learn, they have a real desire to learn, in fact their brain development is forcing them to. They are excited about what they are doing and are laughing; happy in their learning together and by themselves. They take the opportunity to run off all their excitement during regular breaks and to play, play, play. So where is your classroom set? Which country? Which environment? Which school? You see, it doesn’t matter, because this is the ideal classroom in any school, for any child. I know this because I have taught children from all backgrounds, cultures, communities and countries. I have seen my own son form incredible friendships with children in his classes, not despite their differences, but because of their similarities. Because they share the same sense of humour and laugh at the same stories, not because they come from completely different cultures. Because they talk honestly together about what is easy and what is difficult so that they can support each other in their learning, despite speaking different languages. Because they are generous in passing the football so that even the less able players can score, despite being in different houses and on different teams. Our challenge as teachers then, is to do all we can to find out what barriers our unique, individual children may have that stop them getting to the place where they are ready to learn, and then set about removing them in any way we can. Make no mistake, I am not saying that creating this ideal learning environment is easy, or that the challenges in different schools is the same. But we can not afford to make excuses and therefore stop trying. In his paper What Doesn’t Work in Education:The Politics of Distraction, John Hattie writes in detail about the 5 distractions that are all too readily considered before focussing on what we can do to really make a difference, and make the ideal learning environment available to every student in our care. He talks about the pressure to appease the parents, fix the infrastructure, the students, the schools and of course the teachers, all of which distract us away from what we need to be focussing on in order to create our ideal learning environments. What we, as teachers, can do in our own classrooms every day to be better. When a child comes into a classroom so filled with anger because his brother has just been locked-up, or her mother has again been beaten by her abusive father, then it will be impossible for these children to immediately switch into ‘student mode’ and focus on learning. But if we have helped create a classroom or school environment where those children know they will be safe, be listened to and supported, then they at least have a chance at success. Of course the majority of his point here refers to children from a background of poverty, and perhaps rightly so, however, if we are to be creating this safe, positive, inclusive environment for all our learners, then we need to be removing barriers for all our children. As I have already mentioned, I have taught children from a huge variety of backgrounds, all with unique challenges and needs, but in all my experience, I have been most surprised by the low expectations a small number of our most wealthy parents have for their children. I have been told that school is really not important for their children as they will never need to rely on what they learn at school. Their futures are already mapped out for them, so school is just not important, and this makes me incredibly sad. It is these very children who need arguably more than most, to feel equal, to feel genuine friendship, to be liked for who they are not what they represent, and for them to learn how to feel genuine friendship for others, and like them for who they are not where they have come from. I was once thanked by a parent after keeping her from her child for over 3 hours when I had called social services with concerns following a disclosure by her son. I had a duty of care to the boy, but it never feels good putting yourself personally between any parent and their child. I expected hostility and threatening behaviour and was ready for that. But instead this woman taught me what being a mother was all about. No one, she told me, no one in the country she had recently left in order to come to the UK and live in a one room bedsit in Hounslow, no one there would have cared enough about her child to take such action to ensure his safety. She took my hand and said thank you. Wow! I am still haunted by one child who would rather punch and kick a wall and break bones in his own body, than open up and trust another adult and allow us to help him. One child who hated school because it was indoors, another who loved school because it was always cold inside. One child who wanted to be a farmer when he grew up so that he could grow enough food for his family, and another who wanted to be President of his country. But mostly, I have worked with children who loved coming to school to spend time learning and playing with their friends. One shot. Our kids get one shot! I sometimes have to pinch myself and remind myself that only 11 years ago I was a newly qualified teacher in the Hounslow Borough of West London, teaching a Year 3 class of brilliantly strong personalities with challenging, enquiring minds. Children who knew how to be ‘smart’ and had high expectations of me as their teacher. I loved them. They made me cry. They made me laugh and they demanded me to be better. I learned so much from them and this year, was so proud to hear that at least two of them, Zak and Abbie, are about to start at University. They got there through the support of their families, a great many teachers, and by sheer effort and commitment on their part. And they got there despite the fact that I had had them in class with me for a whole year while I was learning the ropes with them! So, I am starting to feel comfortable in my new role, and unapologetic about my position. I have the huge privilege of doing what I can for my ‘class’, our team of brilliant, enthusiastic and eager teachers. I have, perhaps one of the easiest jobs in school; I have colleagues who want to learn and who want to be better, as they have been in every school I have worked in to date. I know already that my colleagues are open to ideas (they have many brilliant ones), they have welcomed me generously and supportively, and I have seen their inventiveness and creativity first hand in the classrooms across the school. I wonder how we can celebrate better what we are already doing well? I wonder how we will develop and improve? I wonder how many of these same dispositions we will see in all our classrooms this year? I wonder how we can model these dispositions better and support their development in our students? All learning is change then isn’t it? We know that the best learning happens when we come out of our comfort zone, in a safe and supportive environment, and start to try new things, explore new ideas and change our thinking, so we need to ensure that we not only model this to our children, by doing it ourselves, but that we constantly give them opportunities to do this too. Now. Today. My new colleagues are yet to share their judgement on how I can support them in that effectively, and I don’t blame them, it is still early days. But I agree wholeheartedly with Alison Peacock ( @AlisonMPeacock ) when she says that ‘It feels enabling to lead from a position of ambitious optimism with faith in others.’ I am truly excited as I wonder what we can achieve together for our students. 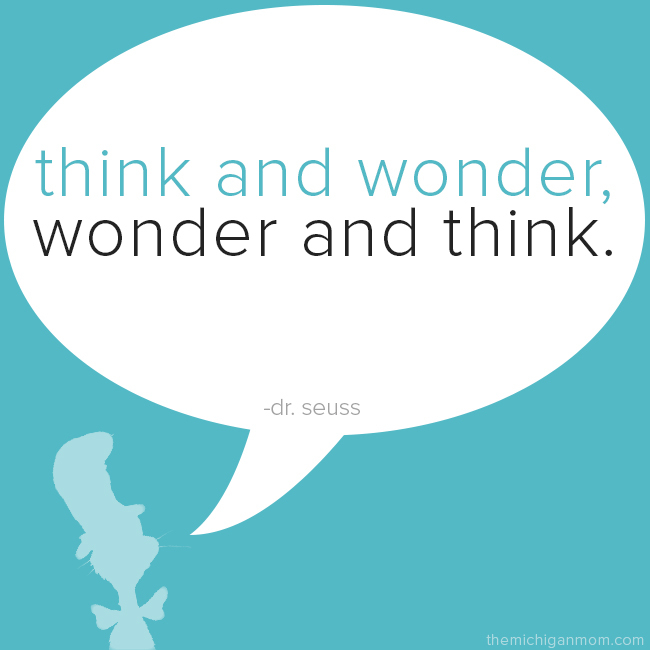 So, I hope to inspire my colleagues to take the time to wonder. To wonder what this year will be like. To wonder how we can better engage our students. To wonder how we can excite our students and support their learning together. To wonder how we can support each other in doing that. To wonder how we will change. And to wonder what we will learn. Interesting reflection, Susan. Always good to hear what you’re thinking. Absolutely agree about the fact that kids are more similar than different – I see that every day too, in secondary – the challenges (and the rewards too) that I see in a private school in Spain are not fundamentally different to those I saw in the state sector in the UK. Also that to change you have to learn and to learn you have to change. I think this is something that children instinctively know but at some stage – at primary, secondary, uni or beyond – many people lose this and become frightened to change and therefore stop learning. The challenge is to recognise when this happens and try to reverse it. I think a relentless focus on results (as the UK system has now become) actively disencourages risk and therefore learning. I am interested in the bit where you talk about considering the impact of activities on learning. I certainly agree with the principle: the difficulty is how do we know? A Christmas production – does it have a positive impact on learning for all those involved or does it distract? Probably a bit of both. Sports day? A team activity? I would assume all these have the positive impact we aim for, but again, how do we know? I’d be interested in how you go about making that decision. Hope the second half of term has continued to go well. Have a good rest at Xmas! I think what we always have to remember to do is ask our kids for feedback. Ask them what they enjoyed, learned, preferred. And ask them what they would do differently next time to enjoy it more or to be able to learn more. Our students are our best, and most honest critics, we just need to keep talking to them and remember that we are in an ongoing partnership with the same objectives: to keep learning better! Really enjoyed reading your blog. Very honest and insightful self reflection, always enjoyed listening to you speak. I’m sure you are making a positive impact on your new school. Look forward to reading your future blogs! As always thoroughly insightful, reflective and brutally honest. This is why I enjoyed so much working and learning with you. Glad to read that you are well! Thank you for this Susan. Truly inspiring how you always put learning at the centre of everything you do. I wish to be half as reflective as you are. I will share this post with Katy, our new Assistant Head. I think she will appreciate your take on learning environments, something she is also very much interested in. Looking forward to catching up soon. Thanks for your positive words Etienne. And don’t sell yourself short, you have always been reflective in your practice! Our students get one shot in our care….We just can’t afford to get to the end of the year and only then reflect on all the things we didn’t quite get around to doing in order to better support our kids this time around. Now. Today. We may be better for our next class, but we are not their tomorrow, so we have to remember that everything we do today has to count. It has to make a difference. More pressure I know, but our kids deserve our very best. Every day! Thanks Jus. I am so glad it resonated with you, but not surprised. We should talk about a guest blog from the parent view about how together, parents and schools can better support kids too? Love it! Good on you for challenging yourself beyond expectation, for inspiring others, and never losing sight of why we wanted to teach in the first place. Thank you Sarah. So glad it resonated with you too. Love it! ONE shot indeed and if not taken, we miss 100% of it. Looking forward to reading more about your journey, Susan – a written sounding board.